When life gets busy and you hardly have a spare moment to yourself, it’s easy to forget about your garden. Even homes with large back-yards filled with potential can be neglected and left to overgrow. Mowing the lawn might be about all you can muster the energy for, and growing too many plants would mean having to rethink your mower route. However, taking care of your garden can transform it into your secret sanctuary. The effort of letting it blossom will fade from your memory once you’re relaxing in your very own paradise. It doesn’t have to be difficult – here are some ideas to give you inspiration on turning your own garden into a back-yard piece of paradise. The first and probably most important step to turning your garden into a peaceful, beautiful place to relax is to start growing plants. Flood your garden with greenery and flowers – even trees, if you like, and notice the tranquility that quickly follows. The process of tending to other lives and spending time outdoors is extremely beneficial for your mental health and gives you time to breathe. Gardening is an excellent activity for taking your mind off other issues in life as it provides a physical distraction that doesn’t require too much energy. Soon, you might even feel as if the act of gardening itself is what soothes you most, but if not, press on until you see the final results. A gorgeous garden can make anybody happy. Choose plants that suit your lifestyle and tastes. 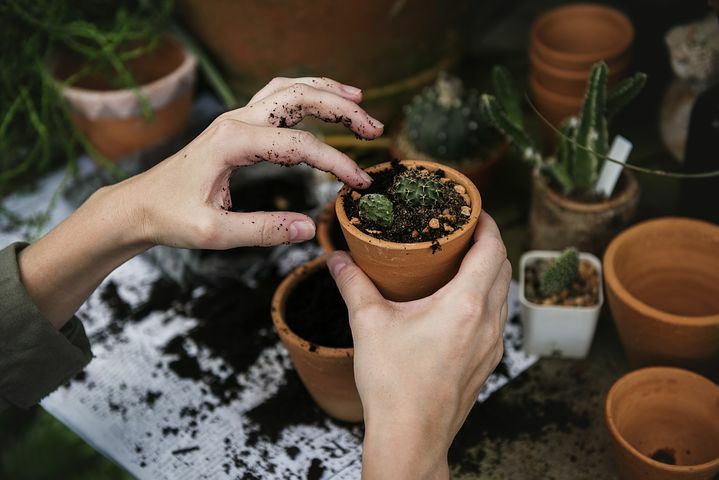 For example, if you are rarely at home, then it’s best to find plants that require little attention and will survive on their own for long periods unattended. If you live in a climate that doesn’t allow you to grow your favorite plant, try using simple and affordable hoop house frames to create a dedicated spot for your greenery to grow. It’s important that you do your research and learn about what each of your plants require from you. Some are extremely low-maintenance while others demand nuanced and complicated treatment. Just find the balance of what you’re hoping to achieve and what you are willing to put into it. Either way, filling your yard with plants will give it a blooming, luscious appeal that you won’t be able to resist. There’s nothing quite like the relaxing sensation that comes with the sound of trickling water. When people imagine tranquility, there is often a pond or waterfall in their mind’s eye. You can have this in your very own garden by examining the layout of your plot and finding out which water feature would work best. Rockeries can provide the right angles and depth for a small waterfall and ponds are great for animal lovers who want to adopt some beautiful fish. Even if your yard isn’t very big, a small fountain can make such a difference to how you see your garden. Invest in some comfortable patio furniture or lawn chairs to enjoy your garden as another room entirely. There’s something deeply satisfying about being able to lounge in the privacy of your own slice of heaven, especially if there’s an element of visual interest such as an elegant water feature. When most people think of nature and the outdoors, they picture animals. Classical, romantic imagery often depicts places of extreme beauty as being filled with all kinds of animal life as well as plants. Entice little visitors to your garden for an added sense of harmony. Birdfeeders attract all sorts of flying guests who wouldn’t usually allow you to see their plumage up close. Ponds invite frogs who can eat the pesky flies while providing some gentle background croaking for increased atmosphere. Certain plants are known for attracting butterflies, dragonflies, bees and other beautiful insects. Of course, protect your plants appropriately from pests such as aphids and slugs. Enjoy your garden by sharing it with all sorts of life, both flora and fauna. The great thing about gardens is that clutter becomes abundance and beauty. Spending time in an idyllic back-yard will ease your mind and soothe your soul, all while bringing new life into the world. Start by choosing the kinds of plants you think you can look after with the least changes to your lifestyle. Learn about the techniques and equipment you might need to plant them in your garden. Add some interest to your yard by installing a water feature, such as a pond or fountain. Feel more alive by spending time with nature and indulge in the luxury that is a gorgeous garden.